Rebeca Grynspan was born in San José, Costa Rica. She was unanimously elected as Ibero-American Secretary-General at the Extraordinary Meeting of Ministers of Foreign Affairs held in Ciudad de Mexico, on 24th February 2014. She took office on 1st April 2014 and in 2018 her mandate was renewed for a further four-year term. In 2010 she was named Deputy Secretary General of the United Nations (UN) and Associate Administrator of the United Nations Development Program (UNDP). From 2006 to 2010, she was UNDP Regional Director for Latin America and the Caribbean. Prior to joining the United Nations, Ms Grynspan served as Vice-President of Costa Rica from 1994 to 1998. She was also Minister of Housing, Minister Coordinator of Economic and Social Affairs, and Deputy Minister of Finance. In addition, she has been a member of the High-Level Panel on Financing for Development, convened by former UN Secretary-General Kofi Annan in 2001. 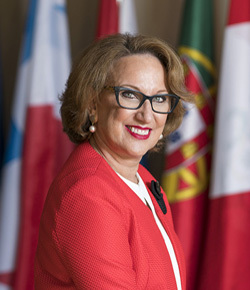 She is a renowned advocate of human development, who has helped to focus the world’s attention, and also that of Latin America, on relevant issues such as the reduction of inequality and poverty, gender equality, South-South cooperation as a tool for development, and the achievement of the Sustainable Development Goals (SDGs), among others. She was also a delegate to the United Nations Commission for the Reconstruction of Haiti, a group consisting of the Haitian government, the former President of the United States Bill Clinton, and other prominent international partners. In June 2014 she was appointed as chair of the Board of Trustees of the International Institute for Environment and Development (IIED), one of the most influential organisations worldwide in the field of policy research, devoted to the study of the interface between development and the environment. Ms Grynspan is a member of the steering committee of the UNICEF Scaling Up Nutrition (SUN) Movement; member of the Governing Council of the Society for International Development (SID), a global network of individuals and professionals at the forefront of development; and member of the ILO Global Commission on the Future of Work, among others. In addition to her experience as a conference lecturer and advisor to a number of international organisations and institutions, she has been actively involved in key United Nations initiatives, such as the Millennium Project’s Task Force on Poverty and Economic Development and the High-level Panel on Financing for Development. In 2014 and 2015, she was recognized as one of the 50 leading intellectuals of Latin America. Since 2016 she serves as a member of the Board of Trustees of the Complutense Institute for International Studies (ICEI), which forms part of the Universidad Complutense, Madrid. In 2017 she received the Forbes Award for Excellence and the Spanish government awarded her the Gran Cruz de la Orden Civil de Alfonso X El Sabio. Ms Grynspan holds a degree in Economics by the University of Costa Rica and a MSc in Economics by the University of Sussex. She has been awarded a Doctorate Honoris Causa by the University of Salamanca, the University of Extremadura and the European University of Madrid in recognition of her professional career.